Ask fellow campers about "Emerald Trails Campground" and nearby attractions. We camped here for 5 months-work related. It was during the spring/summer months and the park was clean and well-kept. It is located in the country on large acreage, and as such, the road on the property leading up to the office is gravel, as are the campsites. It is a lovely setting with large shade trees, lots of green grass, and a large lake. Both the lady who manages the park and her son are nice and helpful. We enjoyed our stay and would definitely return when in the area. We camped at Emerald Trails Campground in a Fifth Wheel. We decided to give this campground a try for its location. Despite all of the outdated reviews we gave it a try. I'm glad we did. We had no issues. It was quiet, relaxing, and exactly what we needed. We camped at Emerald Trails Campground in a Travel Trailer. While the setting for this campground is excellent, the execution is just shy of horrible! The only reason we stayed at this park was its proximity to family and friends. I would never do so again. Go across the border to Indiana, do not come here! The bathrooms are all but unusable, and my wife has refused to use the shower in the ladies room. I didn't think the previous reviews could be true, but believe them. We camped at Emerald Trails Campground in a Travel Trailer. This is a very rustic campground with no paved roads or concrete pads. We were very disappointed in the general conditions present and the mud was so bad from the rain the previous day that we nearly got our dually stuck twice just getting to the site. We opted to leave and stay at another park due to the conditions we found in the winter time. It may be more appealing in the summer months, but we cannot recommend it during any kind of wet weather. We camped at Emerald Trails Campground in a Fifth Wheel. We are here for the location. It is the closest to Chicago we could find at 39 miles to Navy Pier. The posts below sum it all up. Could be a really nice park, just needs new owners and an overhaul. Nice quiet location. Our site has 2 sewer connections under our awning, and next to us there is a 30 yr old junk trailer with some one living in it. Not a very appealing park. We camped at Emerald Trails Campground in a Motorhome. The lake was Green, the Paddle Boats were in bad shape and the Swimming Pond was green and the size of a large puddle. We camped at Emerald Trails Campground in a Fifth Wheel. This park was located in the country. Very beautiful setting with a pond on the site and under a canopy of oak trees. It is hard to get satellite reception under the canopy of trees but it is possible if you work at it. The laundry room is a bit scruffy: 2 washers and 2 dryers. The woman office manager is bit different, as is the caretaker. We were told there were no 50 amps spots available so we took a 30 amp but she charged us for a 50 amp. When we asked why she said because it was a larger lot. Their brochure only prices 30 amp and 50 amp, not lot size. They also cram people in here in the summer time. We stayed from June 08 through April 09. We camped at Emerald Trails Campground in a Fifth Wheel. This is a very nice area, and a beautiful place to put a campground. That being said, this is one of the least favorite campgrounds we've stayed at on our 11,000 mile trip (and we've seen a lot). The campground is not well maintained. The sewer connections are horrible, they are actually uphill from my tank connection, requiring the use of a rubber donut to keep the stuff from running back out of the connection. It's basically just PVC pipe running along the ground that you put your slinky into horizontally. Very strange. Next to our campsite there's an electrical connection nailed to a tree for an overhead lamp with a switch on it. No electrical box, and just a little electricians tape to cover the connections. There are lots of seasonal campers, some decent, some really run down. The worst of it is the lady that runs the place. She was decent enough to me, but it's clear that kids aren't welcomed here. We have a 10 and 9 year old that do a good job with campground voices. They were "raking" some leaves to play in and the lady yelled at them for "covering" the roadway. We didn't, until that time, even know a roadway existed. The entire campground is covered in 4 inches of leaves. Had the staff not walked me to the campsite, I'd never been able to find the path. The nail in the coffin so to speak is that while we were out, the staff actually came and cleared the leaves from OUR campsite only, just to make a point that the girls weren't supposed to play in them. They didn't touch any other leaves. My plan was to put all of the leaves back this evening where we found them (save for putting them over the road), but I guess that's unnecessary. It was definitely a slap in the face. 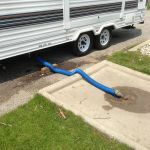 Although camping is limited in the Chicago area, avoid this campground if you can. Jellystone is another option, but no experience there. I personally wish now that I'd have boondocked at a rest area. We camped at Emerald Trails Campground in a Travel Trailer. Are you affiliated with Emerald Trails Campground ?